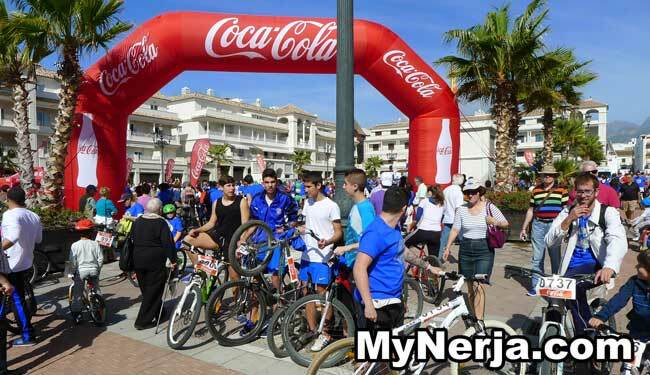 Over two thousand people on bicycles crammed into the narrow streets of Nerja, for the 2015 Dia Del Pedal (Day of the Pedal). The annual event, which takes place every year on Andalucia day (February 28th), had 2,150 participants, close to the record number of 2,374 who took part in 2013. The roads around the centre of town were closed to allow the cyclists of all ages to enjoy the warm weather in a mass bike rally, watched by many more people lining the streets. The prize for most original bike was won by Garaje Cereto, with their eight-seater bike and Antonio Villasclaras, aged 74, won the prize for oldest entrant. Various prizes of bikes were raffled after the race and €1000 was raised for the Taller de Amistad charity.